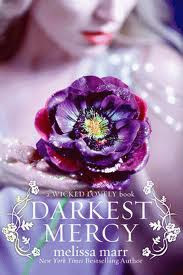 Darkest Mercy is the final book in the Wicked Lovely series (although I just saw Marr released an ebook in January 2011 called Old Habits that is set between Ink Exchange and Fragile Eternity. hmmm....) Finally... FINALLY... we get back to Aislinn, Seth, Keenan and Donia. I could not put this book down. To the very last page I was wondering how it would all end. I think I read it in 2 days... even with the girls keeping me busy. I read every moment I could. I'm not really sure what I can say without ruining the book for anyone planning on reading. Melissa Marr definitely has a way of making me feel connected to her characters. She makes you believe in fairies and, somewhat, in happily ever after.